The Stones’ seventh album was their first composed entirely of originals, and it proved that winsome hooks were not incompatible with snide lyrics. The exotic instrumentation was a triumph for Brian Jones—the Stones’ founding lead guitarist and foremost experimentalist—who plays marimba, dulcimer and, on “Paint It, Black,” slinky, elegant sitar lines. Jagger, meanwhile, revs up his scourge-of-womankind shtick; “Under My Thumb” is a notorious misogynist diatribe, but the organ-driven stomper “Stupid Girl” is even nastier. 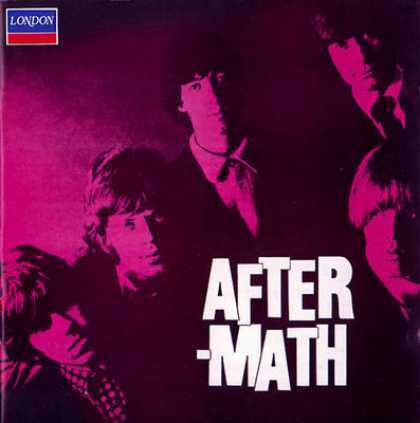 Aftermath, first released on 15 April 1966, by Decca Records is the fourth British studio album by The Rolling Stones. It was released in the United States on 20 June 1966 by London Records as their sixth American album. The album proved to be a major artistic breakthrough for The Rolling Stones, being the first full-length release by the band to consist exclusively of Mick Jagger/Keith Richards compositions. Aftermath was also the first Rolling Stones album to be recorded entirely in the United States, at the legendary RCA Studios in Hollywood, California at 6363 Sunset Boulevard, and the first album the band released in stereo. The album is also notable for its musical experimentation, with Brian Jones playing a variety of instruments not usually associated with rock music—including sitar on "Paint It, Black", the Appalachian dulcimer on "Lady Jane" and "I Am Waiting", the marimbas (African xylophone) on "Under My Thumb" and "Out of Time," harmonica on "High and Dry" and "Goin' Home", as well as guitar and keyboards. The songwriting featured some of the Stones' most overtly misogynistic lyrics and, though full of experiments as noted above, much of the music was still rooted in Chicago electric blues. As with all the Stones pre-1967 LPs, different editions were released in the UK and the USA. This was a common feature of British pop albums at that time—the same practice was applied to all The Beatles albums prior to Sgt. Pepper's Lonely Heart's Club Band—because UK albums typically did not include tracks that had already been released as singles, and because British pop albums generally included 13 or 14 tracks, while American albums usually featured 11 or 12 tracks. The original British version of Aftermath was issued in April 1966 as a fourteen-track LP. Issued between the non-LP single releases of "19th Nervous Breakdown" and "Paint It, Black", Aftermath was a major hit in the UK, spending eight weeks at #1 on the UK album chart. The American version featured different cover art and an alternate, shorter running order that eliminated "Out of Time", "Take It or Leave It", "What to Do", and "Mother's Little Helper". All four tracks were later issued in the US on other compilations, and "Mother's Little Helper" was also issued as a single, in 1966, peaking at #8 on the Billboard charts. In their place, the album substituted their current # 1 hit "Paint It, Black". The revamped Aftermath still reached #2 in the US, eventually going platinum. In 2002, the US edition of Aftermath was ranked number 108 on the List of Rolling Stone's 500 Greatest Albums of All Time. In August 2002 both editions of Aftermath were reissued in a new remastered CD and SACD digipak by ABKCO Records.